If you don't look at this and involuntarily say "holy crap," then you should probably contact a physician and ask him why you're so dead. This Mercedes V12 replica was designed by artist Eric van Hove, who broke the Benz V12 down to 400+ constituent parts and contracted artisans all over Morocco to duplicate it. The overall goal was "Pondering the economic and social dynamic between the European & African industry" but the end result can be appreciated by anyone who is unable to donate a pair of solid wastes about Afro-Euro dynamics. The result is clearly a recognizable engine, but composed of colors and materials and textures so alien to expected industrial production it becomes a magical-seeming object. Middle Atlas white cedar wood, high Atlas red cedar wood, walnut wood, lemon wood, orange wood, ebony wood of Macassar, mahogany wood, thuya wood, Moroccan beech wood, pink apricot wood, mother- of-pearl, yellow copper, nickel plated copper, red copper, forged iron, recycled aluminum, nickel silver, silver, tin, cow bone, goat bone, malachite of Midelt, agate, green onyx, tigers eye, Taroudant stone, sand stone, red marble of Agadir, black marble of Ouarzazate, white marble of Béni Mellal, pink granite of Tafraoute, goatskin, cows- kin, lambskin, resin, cow horn, rams horn, ammonite fossils of the Paleo- zoic from Erfoud, Ourika clay, geometric terra cotta with vitreous enamel (zellige), green enamel of Tamgrout, paint, cotton, argan oil, cork, henna, rumex. Oh of course it has rumex in it, right? 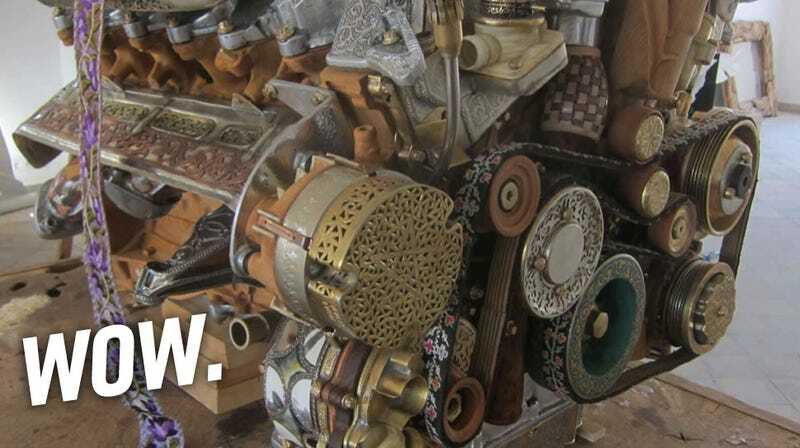 Just look at those parts — you could hang that flywheel on the wall of a Mosque and no one would bat an eye. This thing is genuinely stunning. Even the shipping case/pedestal is incredible. While it likely lacks the heat-tolerance and strength needed to actually burn gasoline and run, I suspect that with the right fuel, say, djinn tears, this thing could make over 500 Pegasus-power. Easy.